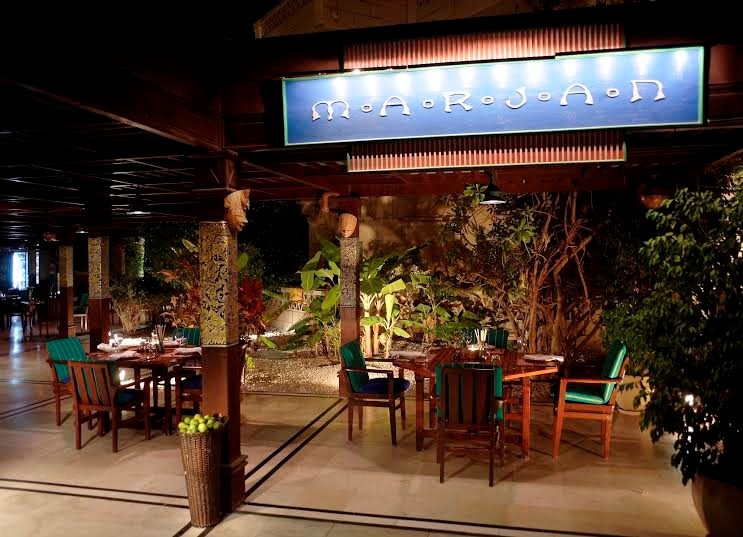 I was fortunate enough to attend a meal at the Marjan restaurant at the Grand Hyatt recently. The Marjan is the outdoor restaurant down by the pool, and now we're into the cooler winter months, it is another fabulous place to dine outdoors. The cuisine of the Marjan is East Asian with appetizers costing between RO 4.7 and RO 8.8, and main courses costing between RO 8.3 and RO 11.7 (including the taxes). I got to try a lot of different dishes and my favourite appetizer was the crispy vegetable spring rolls, they were amazing, and as it turned out, the cheapest appetizer too. The chicken and beef satay was also fabulous, in fact all of it was - but I liked the spring rolls the best! As for the main course, I ordered the Mie goreng Jawa rebus which was incredible - Javenese fried noodles along with chicken, shrimp and vegetables. It was pretty spicy too, just as a warning to anyone considering it! The setting of the restaurant is one of my favourite outdoor dining spots in Muscat, and there are plenty of fans placed around to make sure a refreshing breeze is always there, in case mother nature doesn't want to play along. I was being bothered by mosquito's (it seems I have my own personal swarm that follow me around) and was very relieved to see that the staff at Marjan keep bottles of mosquito repellent available for it's customers to use. If you're looking for a nice spot for outside dining, with drinks if you want them, then Marjan at the Grand Hyatt is a great spot. They can be called on 2464 1234 for reservations. They had mosquito repellent?! Damn it, I never saw that. I had 13 bites on one foot haha. I will know for my next visit. I love the space for NYC events. The main floor is very large and good size without being overwhelming, also there's tons of bar space too to order drinks.